Board and batten is everywhere online and I love it. I really really wanted to do it in the dining room but it took a lot of discussions to figure out if it would work in our room. Mostly, we had a really hard time figuring out how to paint the walls with the coved ceiling and we weren't comfortable adding a wall detail without knowing how to paint above it. Well, after months of bouncing back and forth some ideas, we finally landed on a plan and it included board and batten in the dining room! 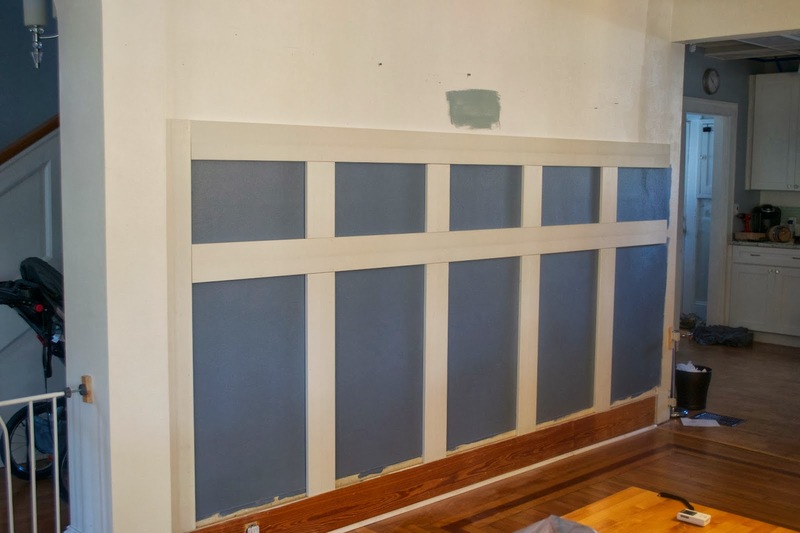 Now, there are a million and one (exactly that amount by the way) tutorials out there for board and batten so I won't go through all the details, but there are some things we did differently. First, we took the top of our trim off before we started. While I understand it seems like more work then tapering the trim that meets the base trim, for us it seemed like it would glare at us saying "I'm not original". For our house we try to stay true to the age and so having built in features look original is really important to us and it really wasn't that much work to build it into the base trim. The second thing we did differently is that we decided to make the "board" part a chalkboard. The dining room is part of Will's play area so we thought it would be really fun to have an area where he can eventually draw and play on the walls. 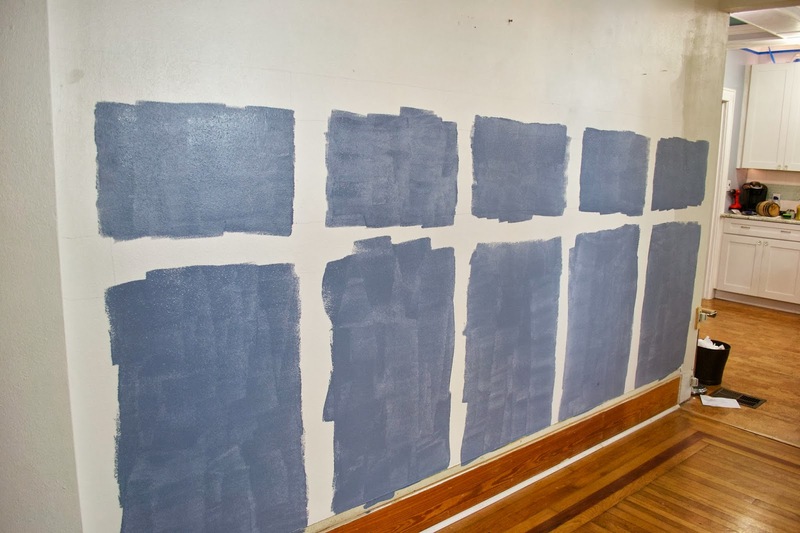 To do this, we used our new laser level to mark off all our lines and then painted in the rectangles with Valspar's tintable chalkboard paint in Faded Denim. We decided to go with the tintable paint instead of black so it wasn't so harsh. Plus, this color goes really well with the kitchen and hall colors. After I put up three coats of the chalkboard paint, we could hang the batten. We used 5 1/2" primed MDF boards. After Nate cut everything down to size, it took a matter of minutes to hang the boards with our nail gun. You can see that with the top trim removed, the board were nice and flush with the base board. 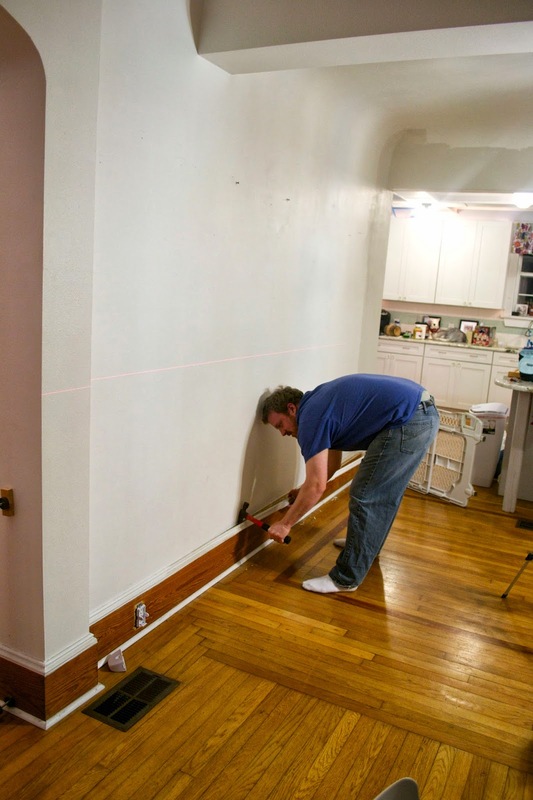 Nate then cut down the top baseboard trim and reinstalled it between the boards. 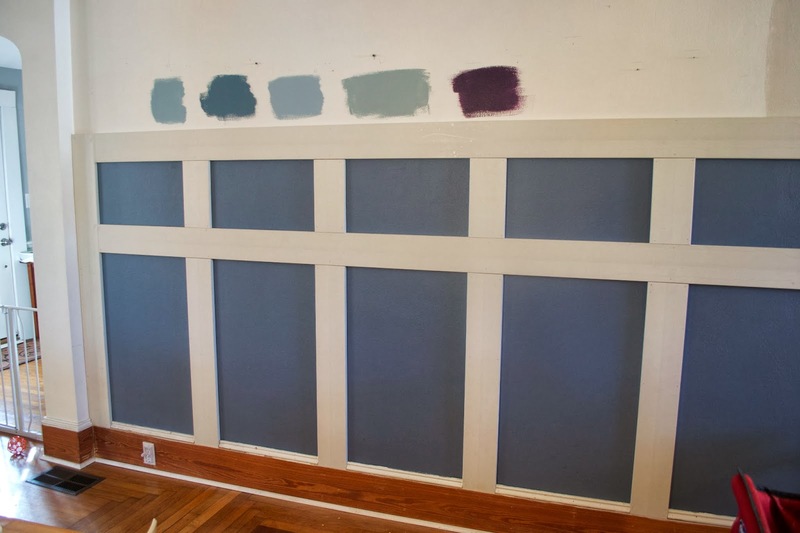 We also threw a bunch of possible wall colors above the board and batten to see which ones we liked the best. 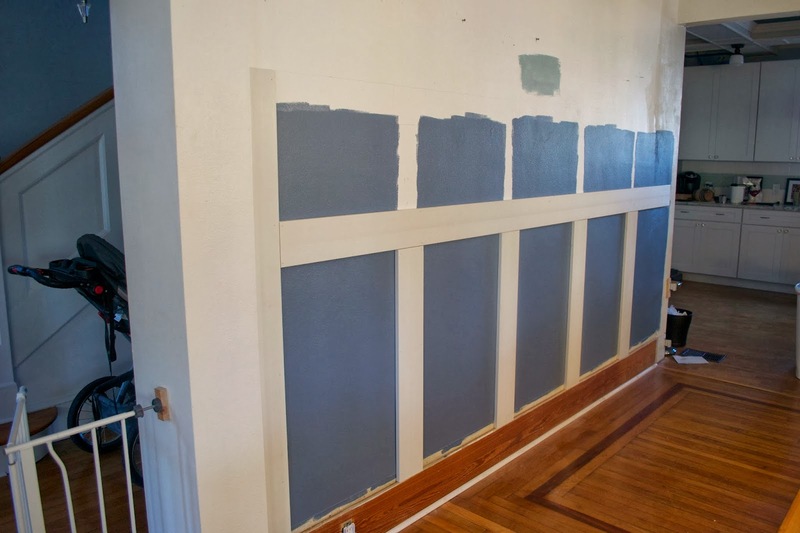 We did this all around the room as well so that we could see which color would go best with all the other colors in both the dining room and living room. We are leaving the insides of the rectangles as they are for right now but we may trim them out eventually to better match the trim in the hall. Up next: caulking, trim painting and wall painting.